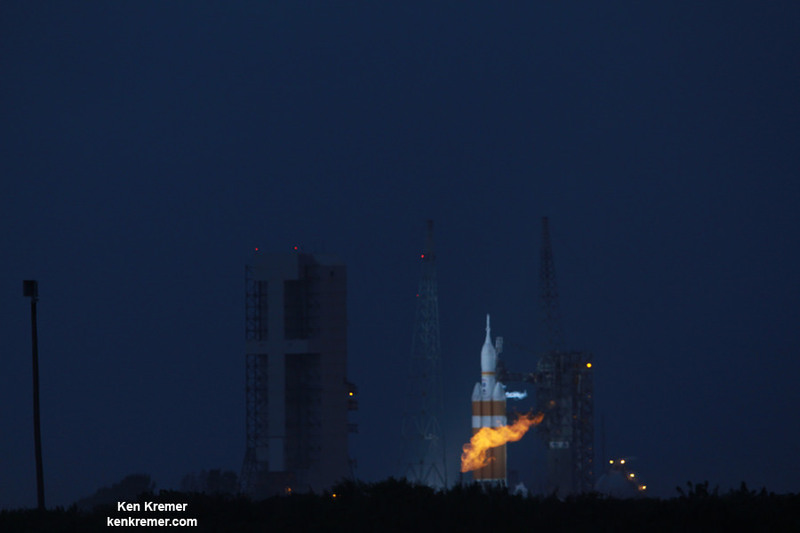 KENNEDY SPACE CENTER, FL – After four decades of waiting, the dawn of a new era in space exploration finally began with the dawn liftoff of NASA’s first Orion spacecraft on Friday, Dec. 5, 2014. The picture perfect liftoff of Orion on its inaugural unmanned test flight relit the path to send humans beyond low Earth orbit for the first time since the launch of Apollo 17 on NASA’s final moon landing mission on Dec. 7, 1972. Orion soared to space atop a United Launch Alliance Delta IV Heavy rocket at 7:05 a.m. EST from Space Launch Complex 37 (SLC-37) at Cape Canaveral Air Force Station in Florida. Enjoy the spectacular launch photo gallery from my fellow space journalists and photographers captured from various up close locations ringing the Delta launch complex. Tens of thousands of spectators descended upon the Kennedy Space Center to be an eyewitness to history and the new space era – and they were universally thrilled. Orion is the first human rated spacecraft to fly beyond low Earth orbit since Apollo 17 and was built by prime contractor Lockheed Martin. The EFT-1 mission was a complete success. The Orion program began about a decade ago. America’s astronauts flying aboard Orion will venture farther into deep space than ever before – beyond the Moon to Asteroids, Mars and other destinations in our Solar System starting around 2020 or 2021 on Orion’s first crewed flight atop NASA’s new monster rocket – the SLS – concurrently under development. Chinese scientists have assembled the highest resolution map ever created of the entire Moon and unveiled a series of global Moon images on Monday, Feb. 6. 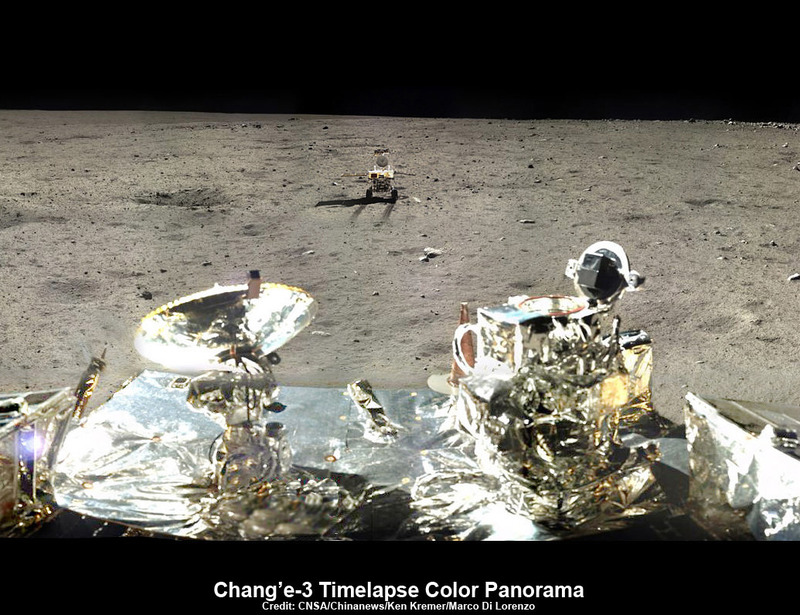 The composite Lunar maps were created from over 700 individual images captured by China’s Chang’e-2 spacecraft and released by the country’s State Administration of Science, Technology and Industry for National Defence (SASTIND), according to reports from the state run Xinhua and CCTV new agencies. “The map and images are the highest-resolution photos of the entirety of the Moon’s surface to be published thus far,” said Liu Dongkui, deputy chief commander of China’s lunar probe project, reports Xinhua. Of course there are much higher resolution photos of numerous individual locations on the Moon taken from orbit by the spacecraft of other countries and from the surface by NASA’s Apollo lunar landing astronauts as well as unmanned Russian & American lunar landers and rovers. Chang’e-2 is China’s second lunar probe and achieved orbit around our nearest neighbor in space in October 2010. It was launched on Oct. 1, 2010 and is named after a legendary Chinese moon goddess. The images were snapped between October 2010 and May 2011 using a charge-coupled device (CCD) stereo camera as the spacecraft flew overhead in a highly elliptical orbit ranging from 15 km to 100 km altitude. The Chang’e-2 maps have a resolution of 7 meters, which is 17 times greater than from China’s first lunar orbiter; Chang’e-1, launched in 2007. In fact the maps are detailed enough that Chinese scientists were able to detect traces of the Apollo landers, said Yan Jun, chief application scientist for China’s lunar exploration project. Chang’e-2 also captured high resolution photos of the “Sinus Iridum”area , or Bay of Rainbows, where China may land their next Moon mission. The camera had the ability to resolve features as small as 1 meter across at the lowest altitude. The satellite left lunar orbit in June 2011 and is currently orbiting the moon’s second Lagrange Point (L2), located more than 1.5 million km away from Earth. Chinese space program officials hope for a 2013 liftoff of the Chang’e-3 lunar rover, on what would be China’s first ever landing on another celestial body. China’s next step beyond the rover may be to attempt a lunar sample return mission in 2017. Demonstrating the ability to successfully conduct an unmanned lunar landing is a key milestone that must be achieved before China can land astronauts on the Moon, perhaps within the next decade. NASA’s twin GRAIL spacecraft recently achieved Lunar orbit over the New Year’s weekend. The duo of probes were just renamed as “Ebb and Flow” – the winning entries in an essay naming contest submitted by 4th Grade US students from Bozeman, Montana. At this time NASA does not have the funding or an approved robotic lunar landing mission, due to severe budget cuts.And even worse NASA cuts will be announced shortly ! Russia hopes to send the Lunar Glob spacecraft to land on the Moon around 2015. Since the United States has unilaterally scuttled its plans to return American astronauts to the Moon’s surface, it’s very possible that the next flag planted on the Moon by humans will be Chinese.